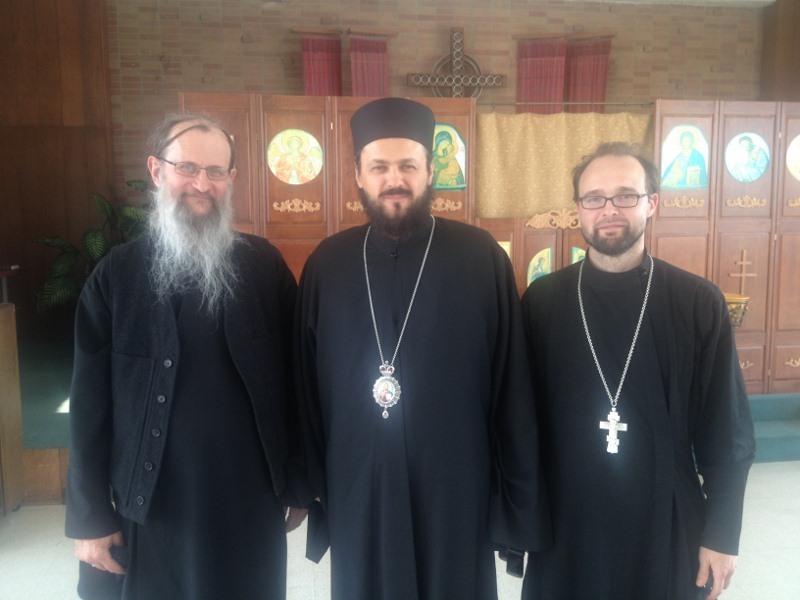 Lawrence, KS - Faithful of Saint Nicholas Mission here hosted His Grace, Bishop Maxim of the Serbian Orthodox Church Diocese of Western America, for a series of talks April 4 – 6, 2013. On April 4, Bishop Maxim spoke about "Styles of Sanctity in Eastern Orthodox Christianity" to a mixed audience of parishioners, members of neighboring parishes, University of Kansas graduate students involved in a seminar on Russian Church history, and undergraduates taking a course on Christianity in KU’s Religious Studies department, taught by Priest Joshua Lollar, the mission's rector. Bishop Maxim met with the Orthodox Clergy Brotherhood of Greater Kansas City on April 5 at Saint George Serbian Orthodox Church, Lenexa, KS, for lunch and a discussion of Orthodox ecclesiology and the Church in North America. Later that evening and the following day, he led a retreat at the mission, focusing on on different views of the human person (theological and scientific) and the practice of holiness. According to Father Joshua, "everyone present experienced His Grace’s deep knowledge of the wisdom of the Church fathers and his ability to let this wisdom speak today.... The mission of Saint Nicholas in Lawrence and the Orthodox community of the greater Kansas City area were extremely edified by this lenten visit." Father Joshua met Bishop Maxim in October 2012 in Belgrade, where he participated in an international conference on the thought of Saint Maximus the Confessor.